A fun outfit post to start the week off! 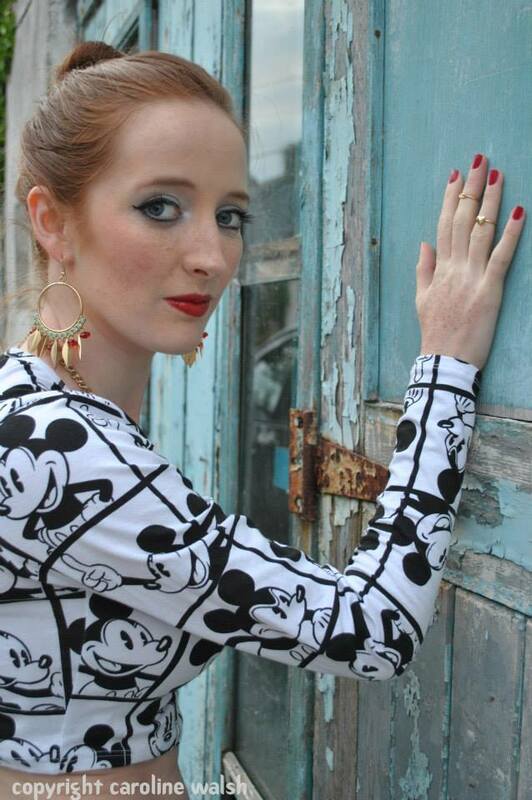 This is a Mickey Mouse Glam look I wore for a photoshoot with Photos by Caroline a little while ago. 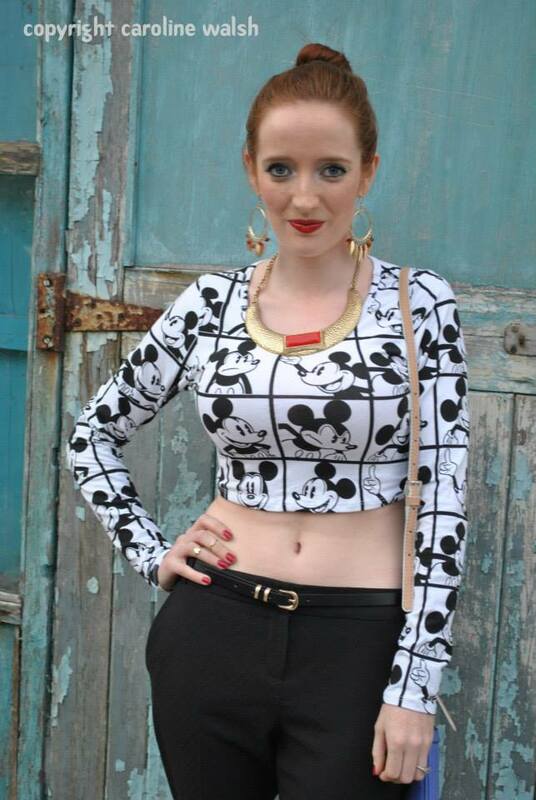 Disney and cartoon inspired fashion never gets old and I like how they add a chilled out and fun element to an outfit. I decided to glam up this cute Mickey Mouse cropped top with black narrow leg trousers from Next and blue/black heels from Penneys/Primark. The fit of these trousers is fab and they can be worn for an office look with a blazer and blouse or something fun like the look I went for. 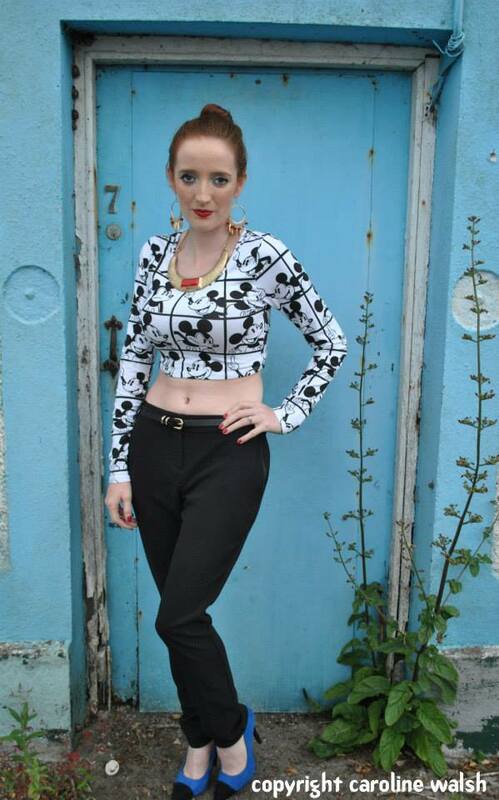 The cropped top is also from Penneys/Primark along with the jewellery I wore. I really enjoyed the cropped top trend this Summer and a long sleeved top like this one is a great transitional piece as we move into Autumn. I added some pops of colour to the monochrome outfit with the heels and also some red in the necklace and earrings. In other news Bec Boop Fashionista World has been nominated for best blog post in the Irish Blog Awards 2013 for the following post ‘Fashion Targets Breast Cancer‘. This competition is driven by public votes and you can vote by clicking this link HERE and scrolling down until you see Bec Boop Fashionista World. Click the little circle beside this blog name and scroll to the bottom of the page to submit your vote. It takes two seconds! Thank you so much to all who nominated and voted for Bec Boop Fasionista World. 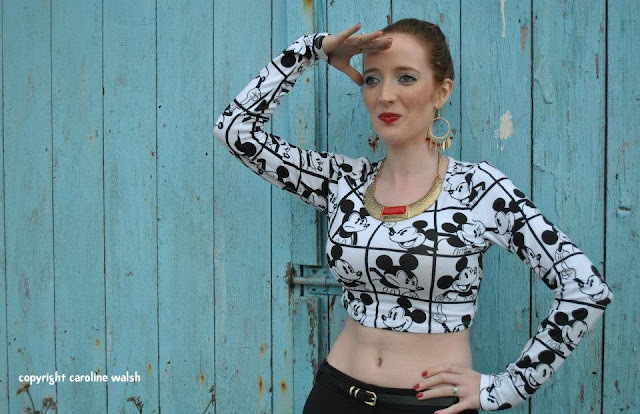 What do you think of cartoon inspired clothing as a fashion trend? How have you glammed it up?